What is 3D body scanning? What are the benefits of 3D body scanning? 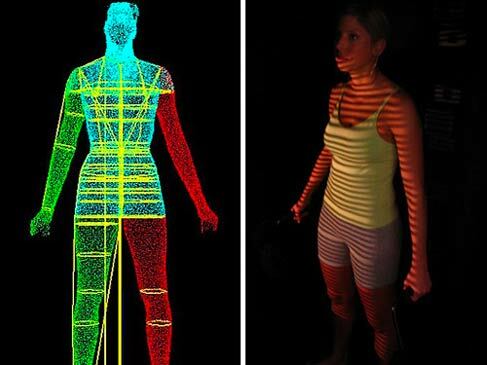 3D body scanning is the action of capturing in 3D the human body using a 3D body scanner. 3D body scanners can capture a human body, or only specific parts, to generate a very detailed 3D model within a few seconds. The result is a 3D model, viewable on a computer, of the body or limb which was captured. Depending on the desired application and on the 3D body scanner used, the 3D model can have colors and textures to perfectly match the original, or simply be a mesh, a sort of cloud of dots forming the shape of the body. All the measurements and 3D capture are made by the full body scanner for an optimal accuracy. 3D body scanners are revolutionizing the way we capture, measure and track evolutions of the human body, in various fields from medical to fitness or entertainment. Recent improvements in whole-body 3D scanning technologies are leading to a growing number of applications. Initially developed for the clothing industry, 3D body scanners are greatly improving our ability to accurately measure and visualize a person’s body size, shape, and skin-surface area. Recent advances in whole body scanning unlock new potential especially for healthcare applications. Non-invasive: 3D body scanning is an entirely non invasive process. The 3D scanner never enters directly in contact with the subject. 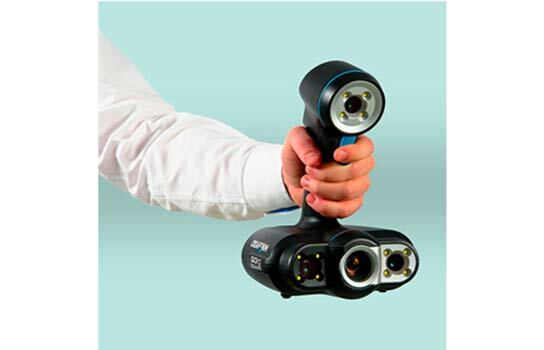 If using a handheld 3D scanner, the device is held at some distance by the operator and is moving around the subject. In the case of a 3D scanning booth, the subject simply stands in the middle of the booth to be captured in 3D from all angles by a number of sensors, rigged to the booth, all without direct physical contact. Fast: scanning in 3D a person with a 3D scanning booth takes less than 10 seconds. When using a portable 3D scanner, the process can take several minuted and requires the subject to stand perfectly still. Accurate: 3D body scanners are high precision tools and usually have a high resolution to produce highly detailed 3D models. They can detect things the human eye can’t, making such 3D scanners very valuable in many circumstances. The quality of the result depends of course on the type of body scanner used. Some 3D scanning booth are capable of capturing several persons at once with a stunning level of details, including colors and textures. Fashion/Clothing: the Fashion industry is starting to use 3D body scanners to capture accurate body measurements in order to make custom and tailored apparel. In retail, 3D body scanning unlocks new potential for in-store and online shopping with the emergence of virtual fitting rooms: shoppers can use their own 3D avatar, based on accurate body measurements, to try on new clothes effortlessly. Healthcare and medical: there are many applications of body scanning in medical fields, from monitoring body shape to identify potential issues to capturing highly detailed 3D models of body parts such as a disabled limbs to make a custom prosthetics for example. 3D body scanning can also help monitor how fast a burn is healing by capturing in 3D the damaged skin, identifying the burnt tissues and measuring the area to track progress, thanks to colors and textures 3D scanning. Avatar creation: 3d body scanning and 3D face scanning can be used in entertainment to create realistic avatars, for video games for example. 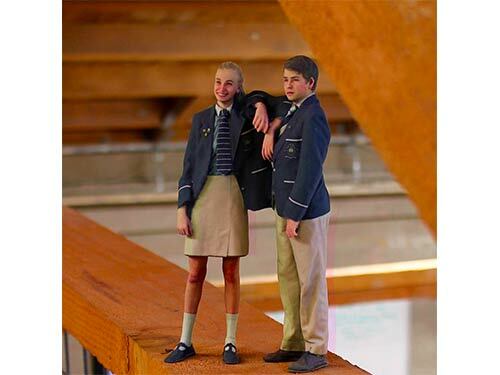 3D figurines: also called 3D selfies or 3D portraits, these miniature statues of actual people are typically 3D printed from a 3D model obtained with a full body 3D scanner, usually a 3D scanning booth. 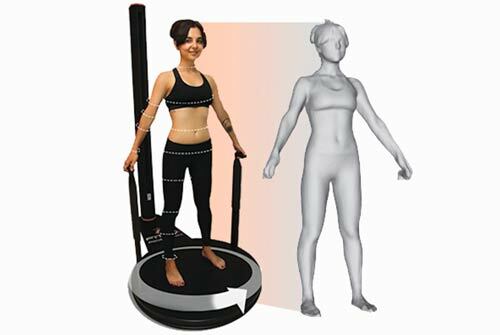 Fitness and body shape monitoring: 3D body scanners are used in fitness to track the progress of a person through various body measurements, body shapes metrics, posture analysis and more. 3D body scanners for the medical industry. 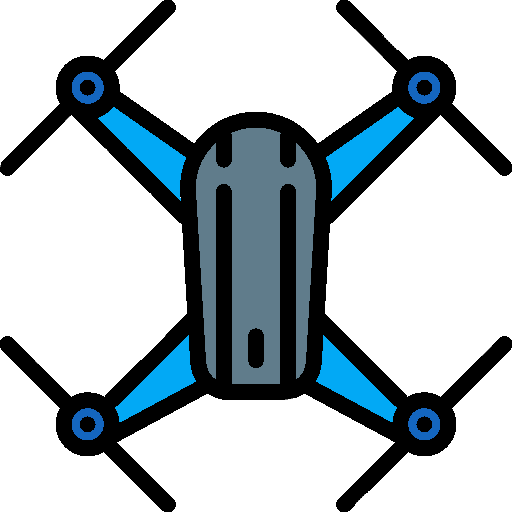 Photogrammetry: A fast 3D capture process consisting of taking many pictures of an object at once and from different angles, then processing them through an algorithm to “stitch” them together and generate a 3D model. Photogrammetry technology delivers high quality, colored and textured body scans. Structured light: A serie of linears light patterns are casted on an object. The 3D scanner then generates an accurate 3D model using triangulation. This 3D scanning technology is highly accurate but requires the subject to be very still. 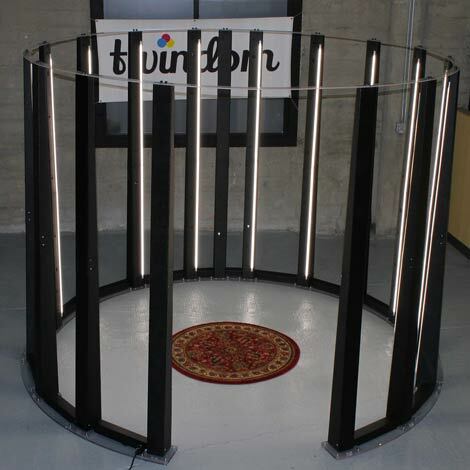 The two technologies can also be used in combination, as it’s the case in 3D scanning booths such as Twindom. 3D scanning booths are cabins rigged with 3D scanners or sensors. The subject person stands in the middle and holds the pose for a few seconds in order for the body scanner to capture images from all angles at once. The body scanner then generates a detailed 3D model of the person, in color and textures in the case of a 3D figurine body scanner. 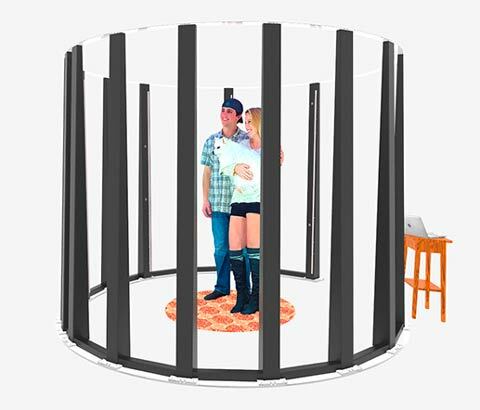 Closed 3D scanning booth or closed body scanner: a circular cabin rigged with cameras or 3D scanners, allowing the subject in the center of the both to be captured in 3D from a 360° angle. Full body 3D scanners or whole 3D body scanners: the subject stands on a rotating turntable facing a vertical 3D scanner. During the 3D body scanning process, the turntable rotates to allow the subject to be fully captured in 3D from all angles. The body scan is generated when a full rotation is complete. Handheld 3D scanners are more flexible than 3D scanning booth, as they can be carried around the subject to perform a body scan. The downside: the person being 3D scanned must remain completely still during the entire capture process, otherwise the 3D scan is unusable. For this reason, in 3D body scanning applications, portable 3D scanners are typically used to capture body parts or limbs and not to perform full 3D body scans. The Go!SCAN 50 handheld 3D scanner. 3D body scanning to help monitor a pregnancy. 3D body scanners are getting increasingly used in the medical sector. Thanks to their non-invasive and fast way to capture the human body in 3D, whole body 3D scanners are a perfect fit for applications in healthcare. Epidemiology: this is the study of the distribution and determinants of health-related states in specified populations. 3D body scanners can be used to do anthropometric surveys. For example, a study on the evolution of obesity amongst children. 3D full body scanners are non invasive, fast and easy to use which makes them perfectly adapted to capture in 3D many individuals, to obtain a meaningful sample for a study. Diagnosis: three dimensional body scanning can help doctors make a diagnosis. For this type of use cases, 3D scanners are mainly used to treat skin related problems (burns, bacterias in the pores, wrinkles…) and detect deformities through the analysis of the patient’s body shape, as captured in 3D. Treatment: 3D body scanners can be the difference between life and death for burnt patients. To give the right amount of medicine to the patient, the amount of burnt skin needs to be perfectly calculated. Indeed, the amount of drug administrated depends on the skin surface and if the drug quantity isn’t right the patient might die. High precision 3D body scanners or handheld 3D scanners can help accurately measure the surface of damaged skin. 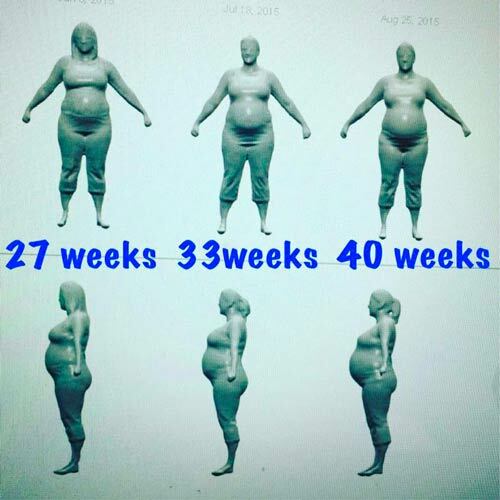 Monitoring: Full body 3D scanners can help monitor the changes in a patient’s body (shape, composition etc), for example in the case of diet or during a pregnancy. Body scanners are a new tool to help doctors and practitioners better track the evolution of their patients body metrics, thus allowing for more accurate diagnosis and recommendations. Prosthetics are a great fit for 3D printing because they are mostly made of plastics and require to be customized to fit perfectly the patient. With 3D printing, it is now possible to make affordable prosthetics such as a hand for example. There are several open-source 3D models of prosthetics which have been developed by online communities such as The Open Hand Project. 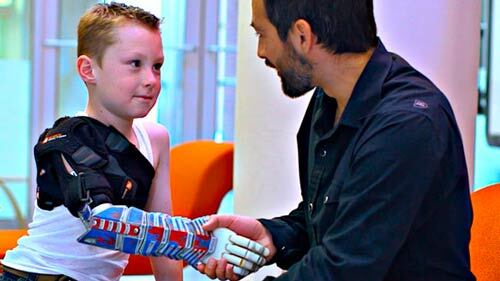 Voluntary designers and researchers join forces and collaborate, aiming to make prosthetics more affordable and better fitted to the patients, especially kids whose prosthetics need to be upgraded often to follow their growth. 3D models of such prosthetics can be downloaded for free then modified to perfectly fit each patient, then finally they are 3D printed on a desktop 3D printer in plastic. 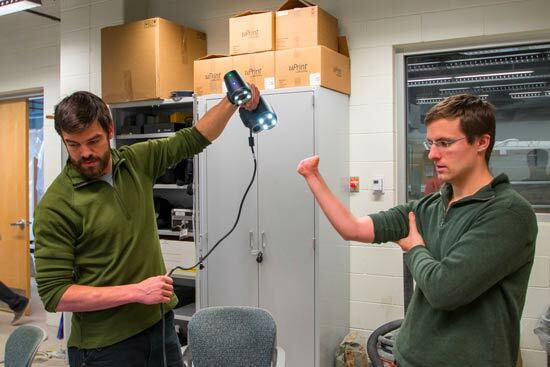 An arm getting 3D scanned to make a prosthetic. A customized 3D printed prosthetic. How can 3D scanning help create 3D printed prosthetics? In order to make the 3D printed prosthetics perfectly fit the patient’s limb, the first step is perform a 3D scan of the area where the prosthetic will be attached. Using the 3D model generated, the 3D design of the prosthetic will be adjusted to match accurately the stump’s shape, thus making the prosthesis more comfortable, durable and performant. In such case, a portable 3D scanner is typically used to capture the body part in 3D, as there is no need for a full body 3D scan. Note: If you want more informations about 3D scanning and 3D printing for the medical industry, you can visit our page about 3D printing for the medical industry. Note: If you want more information about 3D portrait or tips on how to start a 3D selfie business, visit our dedicated 3D figurines page. 3D figurines, also know as 3D selfies, 3D portraits or “mini-me”, are 3D printed miniature figurines representing a person. Some call this 3D photography. With the improvement of the 3D scanning and 3D printing technologies it is now possible to create such accurate 3D printed figurines, perfect as a gift or memory of an important life event for instance. 3D body scanning of the subject. The person willing to get the 3D figurines must first get 3D scanned, using a full body scanner able to capture colors and textures. The best 3D scanners 3D figurines are specifically designed 3D scanning booths. The result: a highly detailed, colored, three dimensional model of the person. 3D printing the 3D model. A few 3D printers are able to 3D print in color but they are usually quite expensive and complex to operate, that’s why most 3D figurines businesses resort to 3D printing vendors specialized in full-color 3D printing. The 3D model is sent to the 3D printing service, which will print it and ship it to the end customer. 3D selfies make great presents are perfect to keep a souvenir from a special occasion (wedding, graduation…). 2 person getting 3D scanned in the Twinstant Mobile. What is the best full-body 3D scanner for 3D printed figurines? The process of making a 3D figurine starts by a 3D body scan. Such full-body 3D scan can be achieved either with a portable 3D scanner, or with a 3D scanning booth. In the case of 3D figurines, we strongly recommend the 3D scanning booth option, as the subject only has to hold the pose for a few seconds to get 3D scanned. Such booths are rigged with 3D scanners, to capture the subject from all angles at once, with a very high resolution, colors and textures. With handheld 3D scanners, the human body 3D scanning process can take several minutes and the subject must remain completely still the entire time (a challenging feat for children or pets!). In both cases, the 3D model obtained is processed through a specific 3D software then sent to 3D printing. The company Twindom launched the Twinstant mobile, a solution perfect to start a 3D figurine business. Their unique 3D scanning booth is indeed able to capture in 3D up to four persons at once, all in a few seconds. The 3D model obtained are then sent out for 3D printing through a global network of 3D printing services, equipped with the best full-color 3D printers. The result: a photorealistic miniature 3D printed version of the person, in vibrant color and with a high level of details. 3D body scanners can capture and monitor data about the human body. Full body scanners can indeed capture thousands of data points on a human body and provide personalized reports and tracking. Body scanner are becoming popular in gyms and fitness centers, or even at home where they can be used almost as a personal coach. With razor sharp accuracy and 3D imaging capacities, 3D body scanners can help fitness enthusiasts track their progression and achieve their personal goals (weight loss, muscle build etc). Three dimensional body scanning can also provide information about posture, body composition (fat vs muscle percentage), body shape. The body scanner becomes a fitness tracker and collects data points on a regular basis, to show the progression via 3D animated clips of the body shape for example. It is important to note that such body scanners for fitness applications are usually not capable of capturing textures and colors, as they focus on shapes only to capture the body shape in three dimensions. The US company Fit3D developed the Proscanner, a 3D body scanner specifically designed for fitness tracking and comprehensive wellness assessment in gyms. They already are a fixture in gyms and fitness centers all over the world. 3D body scanning for fitness. Naked 3D body scanning solution. The 3D scanning process is as simple as standing in front of a mirror, and quite short (under 1 minute). Results are immediately available on the dedicated mobile app. A 3D body scan offers a precise 3D mapping and rendering of a person’s body. It can be used to create virtual fitting rooms where shoppers can easily visualize how pieces of apparel would fit on them, without actually having to wear them. Some apparel retailers already make the most of virtual fitting rooms using 3D body scanning technology. The concept is simple: users create a profile based on their full body scan. They can then virtually try on items from their home or from the in-store 3D body scanning booth. Australian company mPort created the mPod, a fully automated 3D scanning booth able to map the entire human body in seven seconds only. The customer can then use the 3D avatar created to try on clothes digitally. Virtual fitting rooms have a lot of potential in E-commerce, since they can allow online shoppers to virtually try on clothes from the comfort of their home and make sure the size is right before purchasing, thus reducing the return rate for instance. Using a 3D body scanner to try on clothes. Gather more accurate data on body measurements to create best fitting shirts and suits. By capturing in 3D all necessary data points for accurate body measurement in an instant, 3D body measurement systems or body scanning booth gives the opportunity to create custom fitted clothes more efficiently. The company Acustom Apparel uses digital measuring 3D technology to gather every measurement and size from their customers and design custom-fitted attires. The company developed their own digital measuring technologies to gather around 2 millions data points to create the 3D body models of their customers. Based on this data and the personal preferences of the person, an entirely custom-fitted garment is created. 3D body scanners can be used to create realistic avatars, which look like yourself. In specific industries, such as retail or entertainment, avatars created with 3D scanning technology are meant to improve the customer experience. 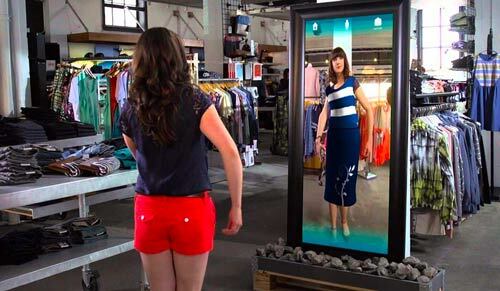 For example, shoppers can use their own 3D avatar to virtually try on clothes instead of doing it physically. 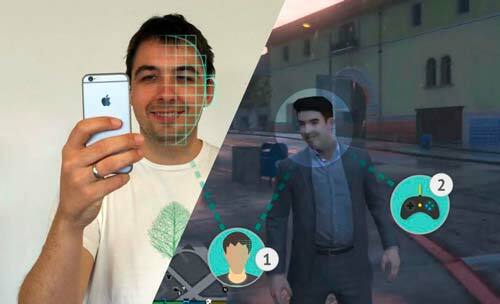 Avatars are also heavily used in video games: using 3D face scanning for example, characters in the game could look like the players themselves, for a more personalized and immersive gaming experience. 3D scanning to make realistic avatars.